By Ashton B. Carler and John P. White, eds., MIT Press, Cambridge, MA, 2001, 326 pages, $24.95. 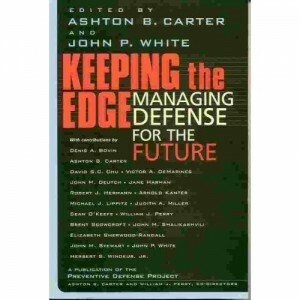 Keeping the Edge: Managing Defense for the Future is a collection of essays published by the Preventive Defense Project, a research collaboration of the Kennedy School of Government at Harvard and Stanford Universities. Ashton B. Carter, former Assistant secretary of Defense for International security Policy, and John P. White, former Deputy secretary of Defense, edit this book, which presents solutions to some of the most pressing problems within the Department of Defense (DOD) and other agencies involved with national.. This is not a book for the average reader. Unless you are involvedorvery interested in the national defense structure this is not a book that will appeal to you. Keeping the Edge is an anthology of defense analysts deliberately attempting to influence the opinion of the then-incoming administration of President Bush at the beginning of 2001. The authors and editors are very up front about this, seeing the beginning of the Bush presidency as the optimum time to effect their recommended changes in policy, structure and management of the defense structure. This is a book about the "Big Picture." […] When intelligence is the topic they are not discussing templated enemy positions and the "most dangerous" course of action of an enemy regiment, they are talking about reform of intelligence collection procedures and organizations at the CIA/NSA/DIA level. For most readers, for that matter for most anyone outside of the Washington, D.C. beltway this may be interesting, but difficult to follow.